Lenovo Vibe C Final Specs Revealed, Now Available In PH Stores For 4799 Pesos Only! 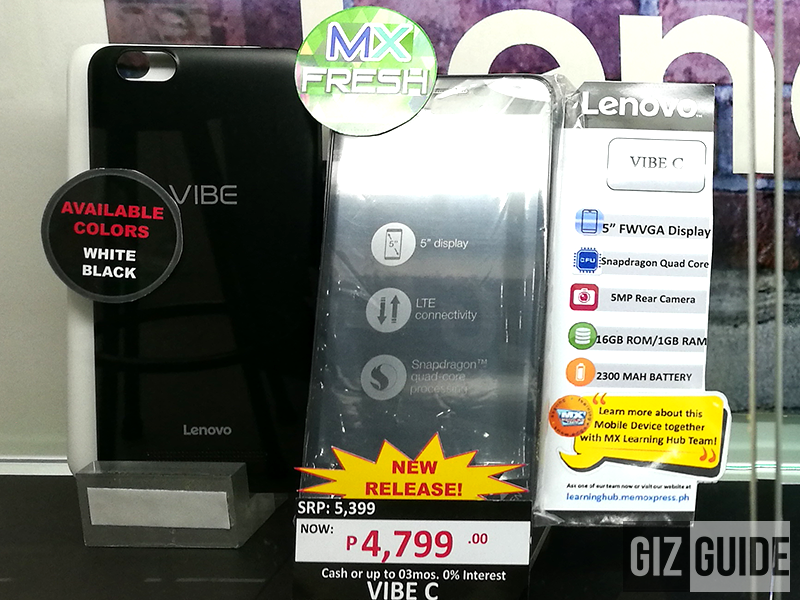 Home / lenovo / mobile / news / Lenovo Vibe C Final Specs Revealed, Now Available In PH Stores For 4799 Pesos Only! In our previous report, we stated that Lenovo will bring their latest budget centric handset called Vibe C with LTE connectivity in the Philippines. Earlier, we got its final specs and confirmation that the said device can now be purchased at Lenovo stores and retailers nationwide. To refresh our minds, the Lenovo Vibe C is a 5 inch device with low FWVGA resolution. Under the hood, it goes with a 1.1 GHz Snapdragon 210 quad core chip, 1 GB RAM, 16 GB ROM, and 2,300 mAh Li Pol battery. It also has a 5 MP and 2 MP back and front cameras for basic usage. The Lenovo Vibe C is priced at just 4,799 Pesos.